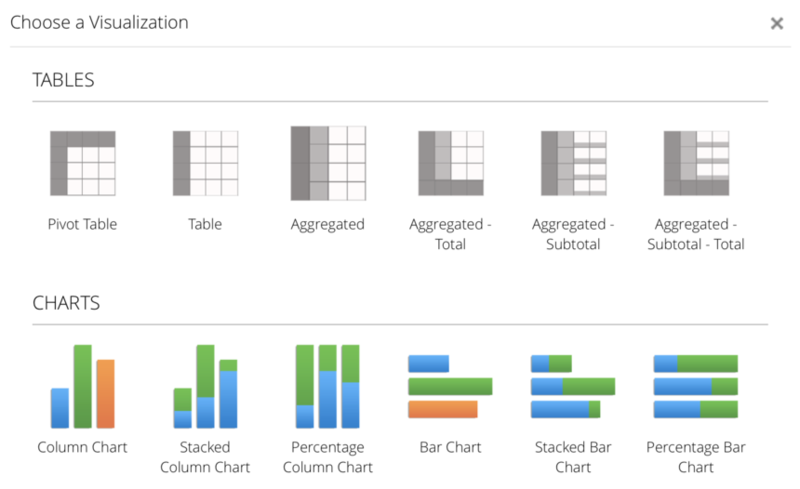 Evaluate measures grouped by different levels of aggregation in the same tabular Insight. Analyze the contribution percentage of one aggregation level with respect to another (e.g. countries contribution percentage to the regional revenue). Prior to this feature, we would use Incorta's aggregated table as the visualization type, measuring the sales revenue grouped by region, sub-region, and country. In this case, we would have a column showing each country's revenue, since the country is the most granular level here. 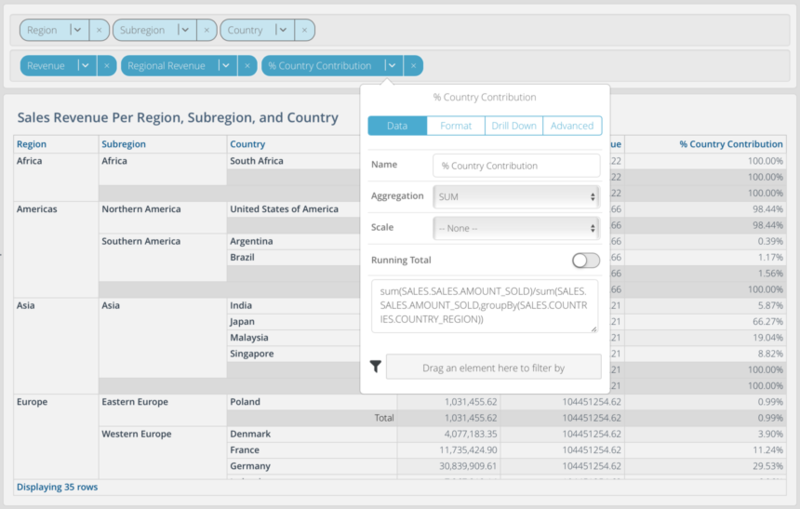 Now, assume we want to add a column showing the sales regional revenue, then analyze each country's contribution to the regional revenue. In this case, we would need to add a level based measure (i.e. 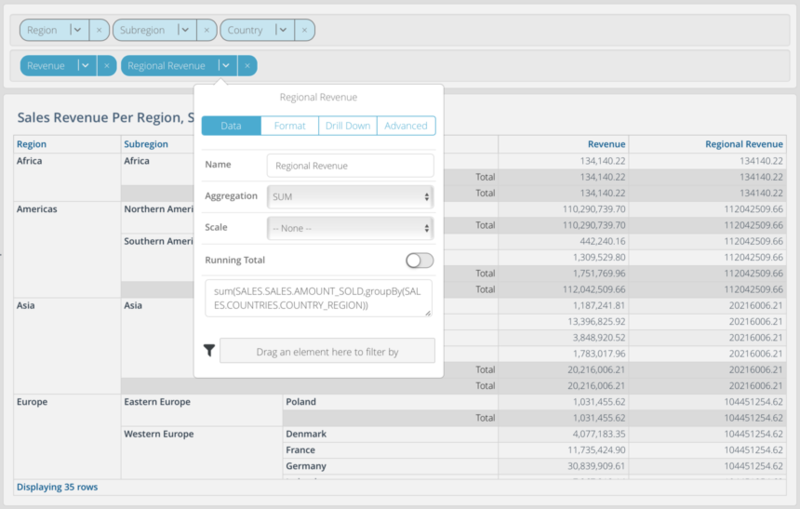 revenue based on the "region" level), then add a formula column calculating the country's contribution percentage with respect to the regional revenue. 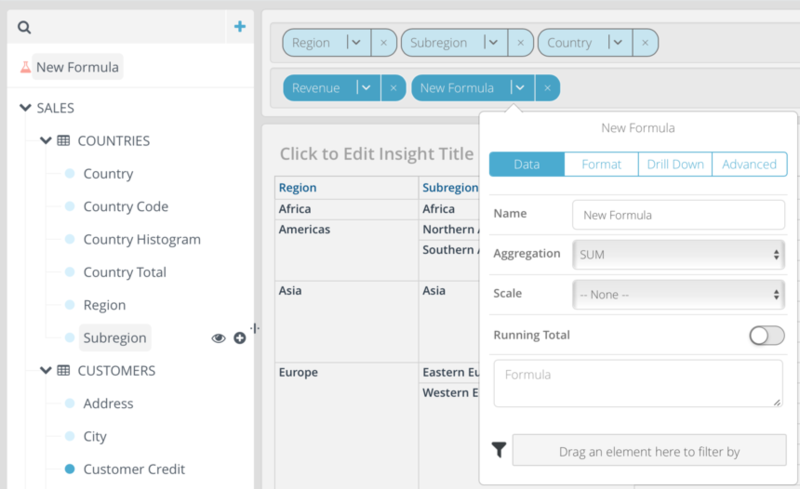 Choose an "Aggregation Table" Insight from the visualization selector window, which appears when adding a new Insight. Drag "Region", "Subregion", and "Country", respectively, from the source elements list on the left-hand side into the grouping dimension field. Drag "Revenue" into the measure field. Drag "New Formula" from the source elements list on the left-hand side into the "measure" field. Click in the "Formula" box to open the Formula Builder. 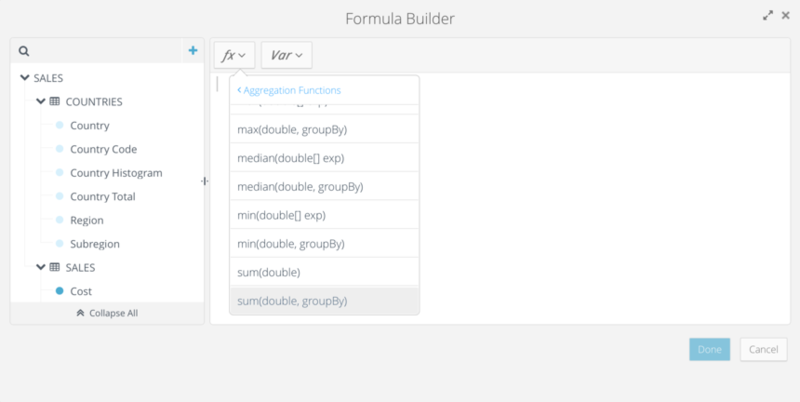 Select "sum(double, groupBy)", under "Aggregation Functions" from the function (fx) menu. Replace the "double vector expression" parameter with "Revenue" as the measure, from the source elements list on the left-hand side. Replace the "dimension" parameter with "Region", from the source elements list on the left-hand side, to group by the region. Click Done. Notice the "Regional Revenue" column is now added to the Insight. Now, to add the percentage contribution column, repeat steps 4-5. Select "sum(double)", under "Aggregation Functions" from the function (fx) menu. Then, divide it by "sum(double, groupBy)". Replace all the double expressions with "Revenue", then replace the "dimension" parameter with "Region". Now let's redo the same analysis, swapping the regional revenue with the subregion revenue. Also, instead of calculating the country's contribution to the region, let's re-calculate the country's contribution to the subregion. It is important to note here that since the subregion is of lower hierarchical level than the region, we must group by all levels used in the Insight of higher hierarchy leading to the subregion level (i.e. region in this case). the groupBy parameter to "Region" and add "Subregion" as a second grouping dimension. The resulting Insight should show each country's contribution percentage with respect to its region. When using a group-by dimension for a level based measure, it is important to include all the leading grouping dimensions in the Insight from the top down to the level based measure to be evaluated. In the example above, the revenue by sub-region included region and subregion in the group-by because the Insight had consisted of the same order in the grouping dimensions. This is a great new feature, but I was hoping it would work for more than just aggregated tables. One of the most common use cases I bump up against that I can't handle with Incorta is showing a simple line graph of % market share of products within a specified category. In your example, it would be like showing a line graph over time with one line/series for each "Country" showing the total "% Country Contribution." But when I try and apply this new formula to anything but an aggregated table where the grouping dimensions are the same as the level-based groupBy parameter. Are there any plans to extend level based measures beyond aggregated tables? Hi Dan Nielsen there are definitely plans to extend LBM to other visualization types. I will follow up directly with our current roadmap plans as well as the other use cases we are considering.